If your wheelchair or scooter is simply too big to fit into your vehicle or if your hitch just isn't rated high enough, a wheelchair trailer is your answer. Transporting your wheelchair or scooter is simple with one of our trailers and is a lot cheaper than buying a car that you can fit your wheelchair in! 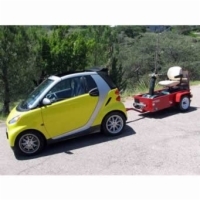 Fitting a vehicle lift to your car and your wheelchair can be a little difficult, but simply attaching a trailer to your vehicle is easy and fits virtually any wheelchair or mobility scooter.